Personal Branding Communication allows for the best engagement. Personal Branding Communication allows for the best engagement. When the content comes from an authentic source that is well branded and personalized, the results create greater engagement. Anyone can hype, oversell and use the same words and same phrases from a brand that is not personalized and is telling oversharing. But, when you apply a well-organized brand that represents you personally and professionally, it is easier to communicate with an authenticity that connects. 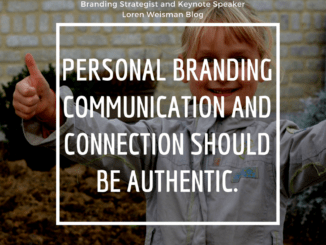 Many talk about personal branding communication, but they miss the boat. it is not selling your brand. It is engaging and sharing about your brand. It is communicating like you would in a conversation to draw interest and allow for a conversation to continue. Build a brand that communicates and connects over just selling and advertising. This will help conversations and connections grow and sustain that much better. You have a story, so bring it into your brand so your communication can be that much more engaging.